Bill O'Reilly fired back at Tom Hanks on Friday after the Oscar-winning star mocked Fox News on MSNBC earlier in the day. As NewsBusters previously reported, Hanks was on "Morning Joe" yesterday attacking Fox News, Ann Coulter, and Tea Partiers. "[H]e goes to a very low rated, left-wing network, where he poses as a producer playing off a video that showed a fight in an Italian TV newsroom," said O'Reilly. 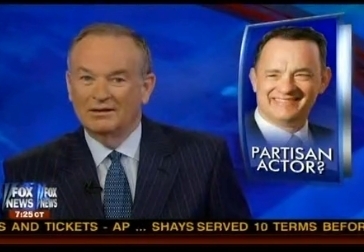 BILL O'REILLY, HOST: For some reason, actor Tom Hanks, who's had a great career, has moved far to the left politically. Now Mr. Hanks is promoting an HBO program. But he won't appear on FOX News, by far, the highest rated cable network. Instead, he goes to a very low rated, left-wing network, where he poses as a producer playing off a video that showed a fight in an Italian TV newsroom. The whole thing was beyond bizarre. TOM HANKS: We can go back to the Italian FOX Network. I want to show that again because I'll add the translation. I think the problem with the Tea Party members is that right now, they're not going to get along. We have to all be - I tell you right now, you know, you put that on the Internet like that, I'm going to kill you. That's not the right story. You can't do that to Ann Coulter. She's a pretty woman. But over the years, Mr. Hanks has become an ideological sniper. And I still don't know why he's like that. What's his beef? What's he talking about? Nobody knows. Now, that doesn't diminish his talent, which is major, but it does make him kind of a mindless partisan. Again, state your case, Tom. Don't be a pinhead. Yeah, Tom - don't be a pinhead!